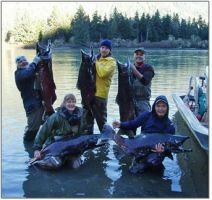 The Wannock River in Rivers Inlet, on the central coast of British Columbia, is renowned for BIG Chinook that weigh more than 50 pounds, and draw sport anglers from around the world. But, Wannock Chinook are considered a stock of concern that merit fishing restrictions and conservation measures to ensure long-term sustainability. Aside from their environmental contributions, these fish bring an economic boon all along their migration route from the Pacific ocean past Haida Gwaii in the North Coast down to Rivers Inlet in the Central Coast, as they draw fishermen for a once in a lifetime opportunity to catch (and potentially release) one of these monsters. For several years now, the Pacific Salmon Foundation has partnered on the Wannock Chinook Enhancement Program. The program is a collaborative approach to salmon conservation partnering industry, community, government and other non-profits. Funding for the program has come from a variety of sources including Tony Allard, a member of the Pacific Salmon Foundation's major donors circle, president of Hearthstone Investments and owner of Good Hope Cannery. Last year, forestry company Interfor also contributed $20,000 to these enhancement efforts. While Fisheries and Oceans Canada contributes the majority of funding year over year, some years have even seen visiting anglers and local guides match funds through personal donations to ensure these stocks have a fighting chance. Eggs for the enhancement program are flown in from Snootli Hatchery in Bella Coola to be released in the Wannock River. Built in 1978, the hatchery is considered Japanese-style hatchery due to the methods and infrastructure use for incubating chum eggs. When enhancement facilities were being set up in BC in the 1970's, the most successful hatcheries producing chum were in Japan. Today, techniques adopted from Japan are standard. During the last 20 years, expansion at the hatchery Snootli Hatchery has increased capacity to 8,000,000 chum, 3,000,000 Chinook, 500,000 coho, and 1,000,000 sockeye. In addition, the hatchery is responsible for maintaining a pink salmon spawning channel on the Atnarko River, inside Tweedsmuir Provincial Park. Fish produced in the hatchery that return as adults support the commercial, First Nations and sports fisheries. They also provide key information to help increase and manage the Pacific salmon and steelhead trout on the Central Coast.